Hematological malignancies, commonly known as hematological cancer, is registering a widespread prevalence across the world. According to the National Cancer Institute, hematological cancer is the fifth most commonly occurring cancer, globally, and is the second prominent reason behind the cancer death in the U.S. Researchers expect the incidence of hematological malignancies to increase further in the coming years, which will result in the growing need for its treatment, impacting the global hematological malignancies market greatly. The opportunity in the worldwide market for hematological malignancies, which stood at US$27.4 bn in 2015, is likely to expand at a CAGR of 7.50% during the period from 2016 to 2024 and reach a value of US$51.9 bn by 2024. The rich product pipeline and the improvement in the reimbursement scenario are likely to drive the growth of the market for hematological malignancies treatment, worldwide, in the near future. Moreover, the rising trend of patent protection is also expected to boost this market considerably in the coming years. Immunotherapy, chemotherapy, and targeted therapy are the three most common treatment methods for hematological malignancies. Among these, immunotherapy led the demand in 2015 with a share of 41.3% in the overall market. The efficiency of immunotherapy, coupled with a lower risk of side effects, has influenced its demand considerably over the last few years. Going forward, blockbuster drugs, such as Pomalyst, Rituxan, and Revlimid, are impacting the demand for immunotherapy positively and are expected to continue doing do throughout the forecast period, leading to a substantial rise in the immunotherapy segment. Targeted therapy is also anticipated to exhibit promising growth in the near future on account of the massive investments made for the development of targeted therapy products. The worldwide market for hematological malignancies stretches across Asia Pacific, North America, Europe, the Middle East and Africa, and Latin America. Supported by the presence of an advanced medical and healthcare infrastructure, North America market for hematological malignancies has been leading the overall market. The growing prevalence of hematological cancer, the rising awareness level of people, and the availability of modern diagnostic technologies are expected to reflect positively on the demand for hematological malignancies therapeutics in the coming years, ensuring the dominance of this regional market. Apart from this, Asia Pacific is also projected to experience steady growth in the demand for hematological malignancies therapeutics over the next few years. The increasing incidence of blood cancer-related mutation diagnostic cases, rising count of government-supported healthcare programs, and the imminent launch of novel drugs is expected to boost the Asia Pacific market for hematological malignancies during the forecast period. Latin America and the Middle East and Africa are anticipated to offer lucrative growth prospects to market players in the years to come due to the availability of untapped opportunities in abundance. AbbVie Inc., Bristol-Myers Squibb Co., Celgene Corp., F. Hoffmann-La Roche Ltd., GlaxoSmithKline Plc., Johnson & Johnson, Novartis AG, Pfizer Inc., and Teva Pharmaceutical Industries Ltd. are some of the leading players in the global market for hematological malignancies. This report provides in-depth region wise and country wise analysis of the hematological malignancies market. Stakeholders of this report include manufacturers of hematology cancer drugs, raw material suppliers, cancer drug processing companies, and new players planning to enter the market. It further presents qualitative and quantitative analysis of the global hematological malignancies market. Qualitative analysis comprises market dynamics, trends, product overview, and country-level market information. Quantitative analysis includes market share held by companies in 2015, market size, and forecast for the global hematological malignancies market in major countries globally such as the U.S., Canada, Germany, France, United Kingdom, Italy, Spain, Japan, China, Brazil, Mexico, South Africa and Saudi Arabia. Market revenue is provided in terms of US$ Mn from 2014 to 2024 along with the compound annual growth rate (CAGR %) from 2016 to 2024 for all the segments, considering 2015 as the base year. The executive summary of the report provides a snapshot of the hematological malignancies with information on leading segments, country wise market information with respect to the market size, growth rate (CAGR %), and growth factors. 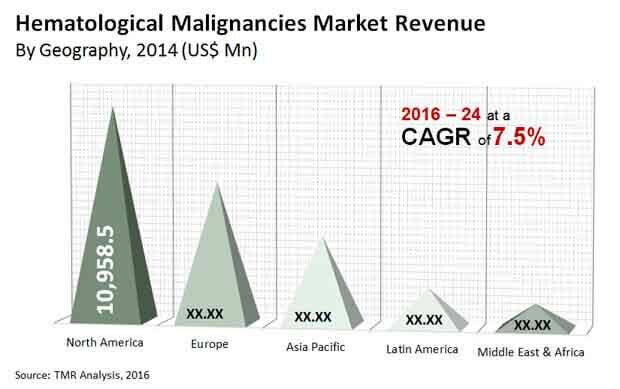 The hematological malignancies market has been segmented as Disease condition type, therapy type, distribution channel and geography. Based on disease condition, the market has been segmented into leukemia, lymphoma and myeloma. Likewise, on basis of therapy the market has been categorized into chemotherapy, immunotherapy and targeted therapy. Hospital pharmacies, medical stores and e-commerce platform are included into the market by distribution channel. Geographically, the hematological malignancies market has been categorized into North America, Europe, Asia Pacific, Latin America, and Middle East & Africa. Moreover, analysis for the major countries comprising U.S. Canada, Germany, U.K., France, Italy, Spain, Japan, China, Brazil, Mexico, South Africa and Saudi Arabia have also been provided in the report. A detailed qualitative analysis of the factors responsible for driving and restraining the growth of the hematological malignancies market in various regions has been provided in this section. This report also includes various ups and downs about particular country or geography that has impacted the overall market globally. The report provides a detailed outline/blueprint of the hematological malignancies market globally that will assist new companies in establishing their presence and market players in expanding their market share in the market. The report concludes with the company profile section which includes company overview, financial overview, SWOT analysis, product portfolio, business strategies and recent developments for market players. The major players that are profiled in the report include AbbVie, Inc., Bristol-Myers Squibb, Celgene Corporation, F. Hoffmann-La Roche Ltd., GlaxoSmithKline, and Novartis AG.